HCC Coders – Verscend Technologies: Hiring nationwide. “Preferred 1+ years of medical coding experience; experience in HCC record abstraction and coding required; high school diploma; nationally certified medical coder as certified by either AAPC or AHIMA; demonstrated high level of quality accuracy and productivity in clinical coding work….” Work from home. Medical Writer – Prahs: “Researches, writes, and edits clinical documents by applying functional expertise and clinical drug development knowledge.” Remote. 200+ Remote Jobs with Non-Profit Organizations – Various Companies: The Idealist.org site is all about connecting people who want to do good (Idealists) with opportunities for action and collaboration. This includes posting many remote jobs for nonprofits. US English Linguists – Appen: “Appen is looking for native speakers of US English who have a strong background in phonetics/phonology to help with a phonemic transcription project. The work will involve checking and correcting spelling and US English pronunciation of words in phonetic alphabet. 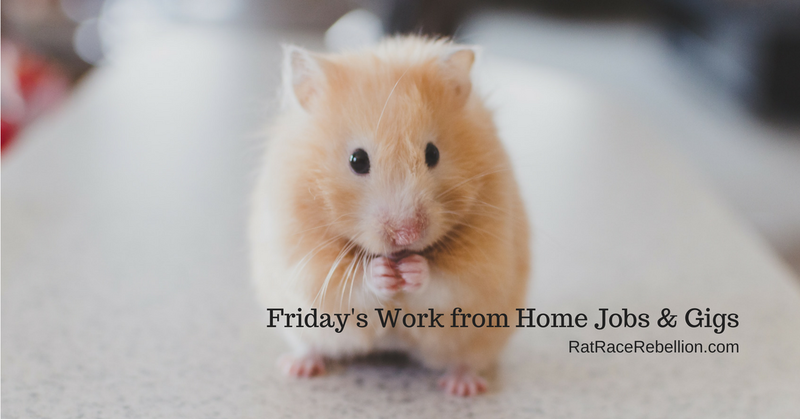 Work can be done online from anywhere in the world, and is on flexible basis (minimum availability of 15 hours per week would be ideal).” Work from home. Outdoor Advertising Agent (Richmond, VA area applicants) – State of Virginia DOT: “Administer outdoor advertising and junkyard programs in assigned area in accordance with VDOT procedures, Virginia statutes and regulations. Assist with permit issuance and compliance issues for outdoor advertising, junkyards and vegetation control.” Remote. Work from Home Infomercial Sales Agents (Inbound Calls) – NexRep: “We are unable to accept agents from NY, CA, RI, WA, AR and OR…. Take calls from customers for Copper Chef, from infomercials. Commission-based. “Top Agents earn $20/hr.” Part-time. 11 Ways for Kids to Make Money Online – Here are just a few of the ways — all screened and legitimate — that teens and younger children can start to earn some income of their own online. Part-Time Customer Success Agent – Accredible: Still accepting applications. “You will be working on a busy support desk answering tickets by phone, email and live chat. You’ll provide world class customer support and turn detractors into promoters; $13-16 per hour – salary depending on experience.” Remote. Special Education Teacher (FL applicants) – Connections Education: “Degree in Special Education or related Education Field, valid Special Education credential in Florida….” Remote. Policies & Procedure Writer – CareCentrix: “Write, maintain, and update Policies and Procedures (P&P), Desk Level Procedures (DLP) and workflow diagrams along with other process resource tools utilized by the organization. Coordinates, writes, tracks progress, edits and formats documentation in accordance with guidelines and to meet business needs.” Remote. 37 Work from Home Jobs with No Experience Necessary – Many legitimate home-based jobs and side gigs don’t require experience. They can be a springboard to other jobs, or a source of extra cash for bills or essentials. Here are 37 open now. Lead Workers Comp Claims Adjuster (MD applicants) – Nationwide Mutual Insurance Company: “Investigates, coordinates and processes the most complex medical and indemnity workers compensation claims involving multiple states to determine compensability, entitled benefits, average weekly wage and benefit rate, in accordance with applicable State Workers Compensation Statute.” Remote. Digital Editor, RTR Foundation – Rent the Runway: “The Digital Editor will be responsible for all of our online communications, including the website, blog, and all social channels. This role will lead daily editorial planning and production for projectentrepreneur.org, working with the PE team to execute a content strategy across digital platforms.” Remote. Hundreds of Work from Home Jobs with BENEFITS – Various Hirers: Not all things that sound good are untrue. Working from home with benefits, for example. As at-home jobs continue to go mainstream, many companies, including Fortune 500s, are offering benefits. Here are hundreds of positions open now. Rock Your Rebellion! Extra-Cash Option – Shop at Walmart or Target? Get Quick Cash Rebates for Your Purchases – Ibotta: $10 welcome bonus. Pays cash rebates — usually within 24 hours — for purchases at Walmart, Target, Shoppers, and over 300 more retail locations. Free. Cash via PayPal, Venmo, or gift card (your preference). Food Assistance Program purchases also eligible.